This home-entertainment projector is basically suitable for replacing or supplementing a TV in your family room, unlike home-theater projectors that are designed mostly for permanent installation in rooms with theater-dark lighting. Another factor that makes this model a home-entertainment projector would be its built-in sound system. There is enough volume to fill a living room or family room thanks to the 10W mono speaker that delivers suitable sound quality. The BenQ HT-series HT1075 is a low-cost projector which delivers great image quality. Also, it adds MHL support meaning it will be much easier to use this projector with mobile devices. The menu system is more user-friendly which is particularly helpful for those first-time projector owners. This projector produces a sparkling, bright picture straight out of the box, so there’s no need to worry if there’s no perfectly light-controlled room in your house to put it in. You can easily use this projector in your living room or family room, and it will still work and look very good. 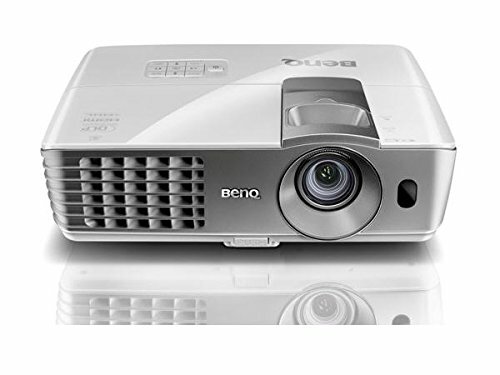 This is actually the reason why BenQ advertises this projector as a home-entertainment projector, a home theater projector, or a living room-projector. Therefore, the BenQ HT-series HT1075 3D projector does benefit from a great viewing environment. This model boasts a 6-segment RGBRGB color wheel which is ideal for video and film use. Cinema mode boasts excellent color, right from the factory, so this projector makes an amazing first projector for those interested in home theater. Also, it is really bright, so you can utilize it on a really large screen and still have a compelling picture. MHL (Mobile High-Definition Link) helps connect this projector to mobile and standalone devices such as streaming media players (like the Roku Streaming Stick), or smartphones. This projector’s second HDMI port is MHL-enabled which allows you to watch Netflix without a separate device, or watch HD videos from your smartphone. This feature is particularly handy and useful when you are using the BenQ HT-series HT1075 3D projector as a portable entertainment projector. You are able to watch content from different streaming services using only the projector itself and the Roku Stick. The only thing you need to plug in is the HT1075 itself, since MHL supplies power to whichever the attached device is. Simplified menu on this model from BenQ is full of bright, big buttons with more than enough descriptive text labels. This menu is a great option for those who do not enjoy learning what all the projector’s controls do, or simply don’t want to spend their brain capacity or time to learning the ins and outs of the projector. However, if this is not your first rodeo, just enable the Advanced menu that will provide access to the complete list of settings and adjustments.